Flaming Gorge and the land that surrounds it are some of the most scenic and uncrowded landscapes in the west. Picnicking here is a fantastic way to experience this remarkable environment. 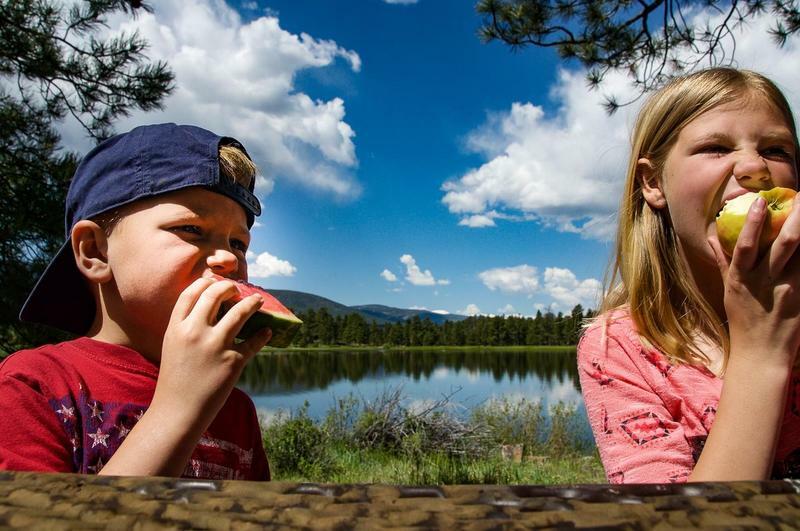 With over 600 camp and picnic sites, plus countless undeveloped regions spread throughout the area, you’re going to find the perfect lunch spot in any direction you head. So pack some food, load up the car, and get ready to absorb the diverse and attractive sites that set Flaming Gorge apart, all while enjoying a midday meal with family and friends. Here are three highlighted picnic areas that are worth a visit. Sheep Creek Canyon has two popular sites: the Navajo Cliffs Area, right off highway 44, and the Palisades Picnic Area, five miles up the canyon. Either of these sites are a perfect place to stretch your legs and grab a bite during your auto tour of the Sheep Creek Geologic Loop. 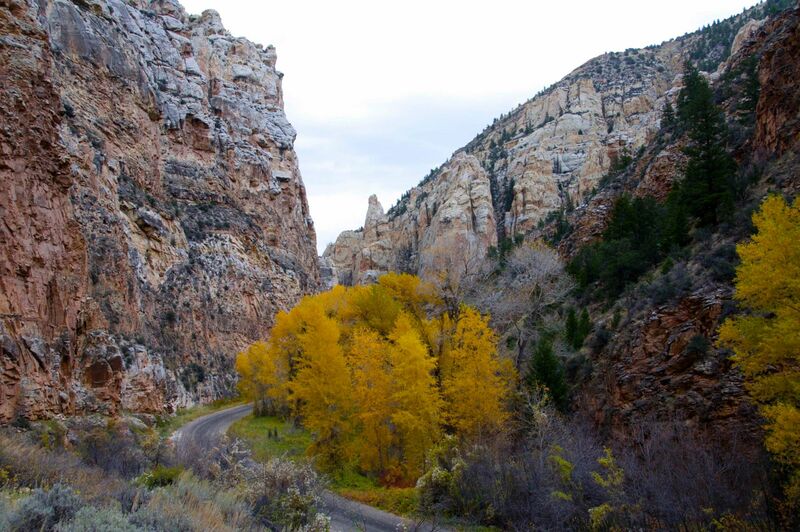 This loop is a wildly scenic 10-mile section of road that winds through the center of the Uinta Crest Fault. Along its course you will see exposed layers of the earth, sandstone, shale, and limestone jutting up in crazy angles. One of the more impressive features, Tower Rock, is piece of Weber sandstone located right next to the road between the Navajo Cliffs and Palisades sites. While eating lunch in the shade of mature cottonwood trees be sure to keep your eyes open. Rocky Mountain bighorn sheep make this area their home and are often seen wandering through the canyon’s craggy cliffs. Little Hole is a boat launch found five miles east of Dutch John along the Green River. A visit to the blue ribbon waters in this gorgeous canyon, miles below the impressive Flaming Gorge Dam, is a must-see for all visitors. Between boat ramps two and three you will find tables surrounded by trees. Enjoy your meal and watch the river where otters swim back and forth, birds of prey glide on thermals above, and people float by in rafts and drift boats. After lunch be sure to check out the scenic Little Hole Trail. It runs the seven miles between the dam and here. Relatively flat, this meandering trail is the perfect place to walk off those midday treats. And if you are an angler, be sure to bring your rod, as this section of the Green reportedly holds 14,000 fish per mile! Positioned 1,400 feet above the blue waters of Flaming Gorge Reservoir is the Red Canyon Visitor Center. 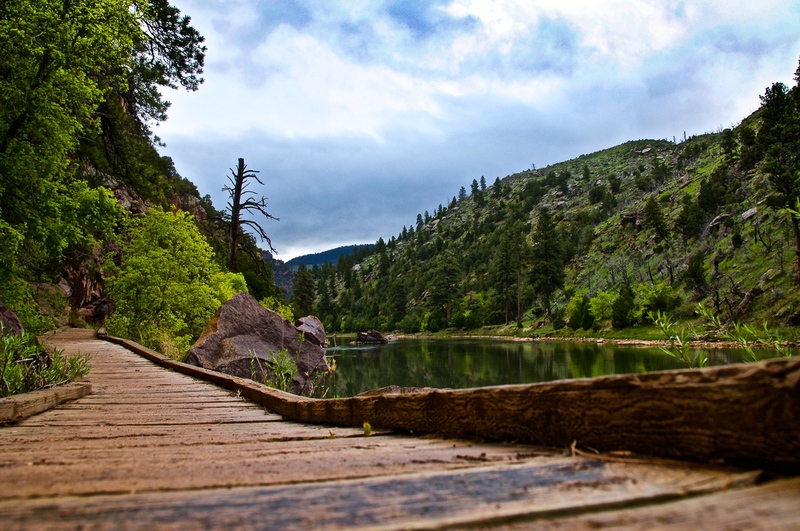 This stellar picnic location, on the south end of Red Canyon, is found within an open ponderosa forest where stunning views, beautiful wildlife, and information can be found. Before or after your picnic be sure to stop into the visitor center to learn the history and ecology of the region from the friendly staff. From the overlook at the visitor center there is a good chance of seeing bighorn sheep hanging out on the canyon’s red walls. After your meal, take a pleasant walk through the interpretive nature trail and carry on via the Canyon Rim Trail that leads to the Greendale Overlook, 3.8 miles from the visitor center. Moose, elk, and deer are often seen grazing in the open meadows nearby. 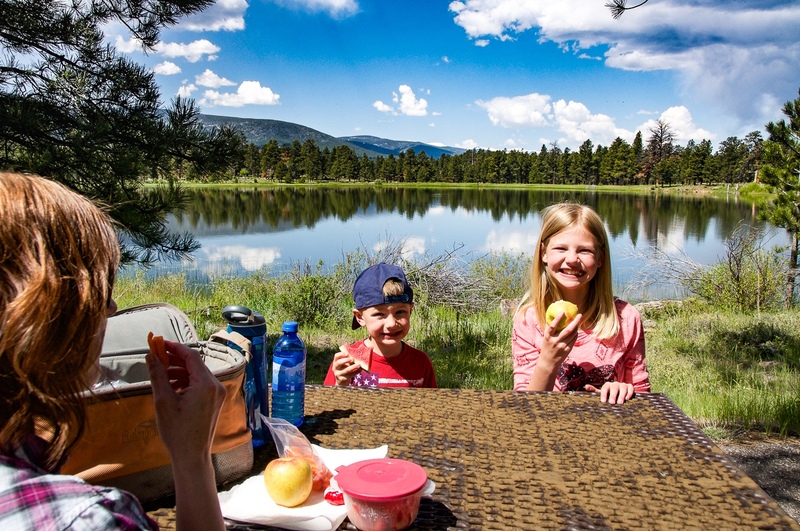 Other picnic areas worth noting at Flaming Gorge are Dowd Mountain, Browne Lake, Sunshine Cove Swim Beach, and the Flaming Gorge Dam. You are also welcome to picnic at any of the area’s campgrounds Monday through Friday between 12 and 4pm. Dowd Mountain can be found four miles off Highway 44 at the end of Forest Road 094 and it offers uncrowded views of the reservoir from a subalpine plateau. Browne Lake is located off the Spirit Lake Scenic Byway in the Uinta High Country and is great for fishing and scenic viewing. Sunshine Cove is a great beach and swimming zone on the east side of the lake north of Dutch John near Mustang Ridge Campground. The Flaming Gorge Dam peninsula is a fun location that can be visited after taking a tour of the dam and its position on the lake is known for rainbow trout. If you happen to have a pole this would be a great place to drop a worm while you lunch. 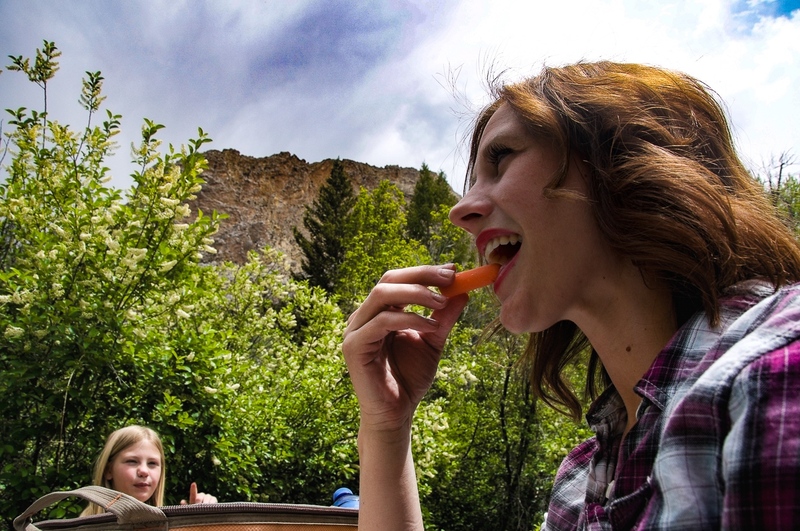 Whether you are touring around taking in the sights or merely passing through, picnicking in the Flaming Gorge National Recreation Area is a treat. A few hours spent breathing in the fresh air, watching wildlife, and soaking up the landscape will leave you refreshed and recharged. What are you waiting for? 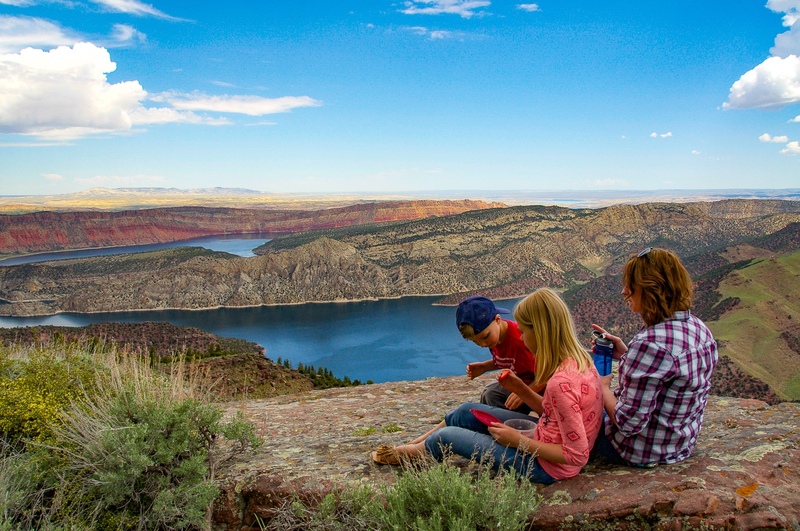 Pack a lunch and hop in the car, there’s so much to see and do at Flaming Gorge. Thank you for visiting http://www.flaminggorgecountry.com/picnic-spots! Be sure and revisit flaminggorgecountry.com frequently for content updates and more.